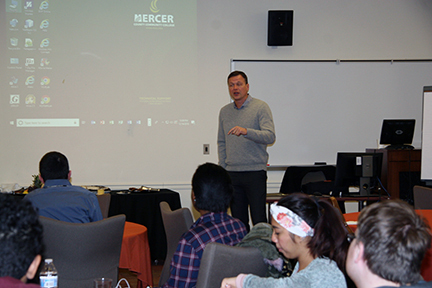 West Windsor, N.J. – The second year of Mercer County Community College’s (MCCC) Entrepreneurial Master Class continued to help students build their toolkits by offering a holistic understanding of the business world. 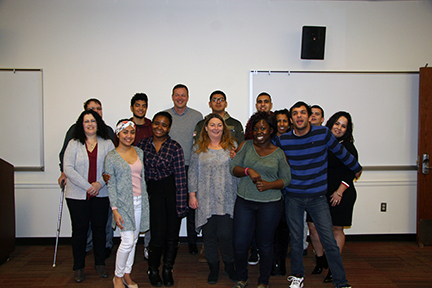 Organized by the Division of Innovation, Online Education and Student Success under the direction of Dr. Alexandra Salas, the workshop took students from inspiration to action, as they learned how to present themselves and their ideas to a group. Students who completed the seminar also received a certificate of completion, a letter of recommendation, and access to a networking community. Over three sessions, students in the Master Class were pushed to learn leadership by visualizing, conceptualizing and implementing a personal plan for the future. Each meeting was led by Simon Nynens, New Jersey Institute of Technology Vice President of Business Incubation and Executive Director of Commercialization, who volunteered his time. Nynens’ approach to the course drew interest from a diverse student group. Among them were students pursuing careers in traditional business, law, social work and more. According to Nynens, that entrepreneurial mindset originates from control over three parts of the body: the storyteller, the physical body and the judge. “Being able to listen to each of these voices, and knowing when to shut them out, is important to finding personal success,” Nynens told the group. The course also addressed motivational and self-help principles. Nynens emphasized that keeping an open mind prevents people from setting narrow and unrealistic expectations. and Student Success, and Alfred Powner II. Nynens answered student questions over lunch for the last meeting of the Entrepreneurial Master Class.